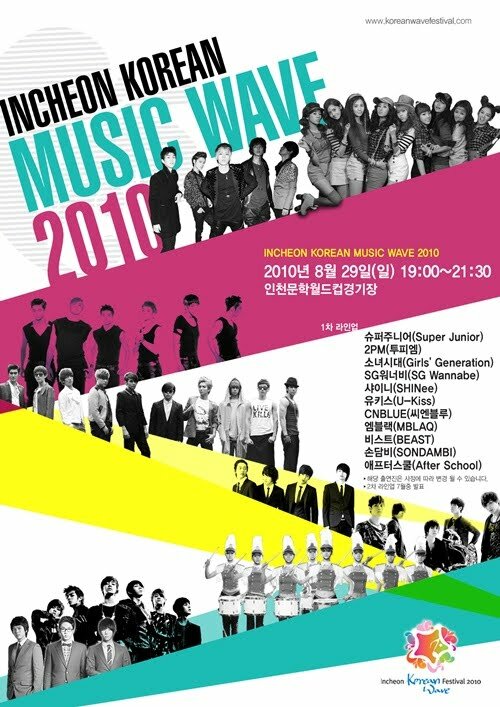 Incheon Korean Music Wave 2010 this August 29 featuring Super Junior, SNSD, MBLAQ and more! The nation’s Top stars are going to gather at Incheon! Incheon Korean Music Wave 2010 concert will be held on August 29, 2010 at 7:00 pm KST in Incheon world cup stadium. This years Incheon Korean Music Wave 2010 will be featuring the nation’s top stars which includes Super Junior, SNSD, 2pm, SHINee, Son Dam Bi, U-Kiss, MBLAQ, After School, SG Wannabe, CNBlue and BEAST. The tickets are scheduled to start being sold by mid July with over 10,000 seats. This concert is unlike any other large concerts. This concert will be promoting the nation’s best idol’s to encourage more tourists may it be domestic and foreign to promote the wonder’s of South Korea. The concert will be staging the best korean pop stars in Asia to represent the country, this will be one big K-pop music festival. Meanwhile, more details can be found on their official website for the Incheon Korean Music Wave 2010. This entry was posted on July 6, 2010 by heedina. It was filed under Band, Boy Band, CN Blue, Concert/Show, Girl Band, News and was tagged with 2PM, After School, BEAST, CN Blue, MBLAQ, SHINee, SNSD, Super Junior, u-kiss.